The Road to Hana: Kung Hay Fat Choy! 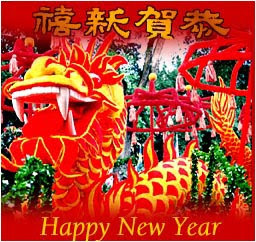 Wishing you all health and happiness in the year of the Boar! The year of the Boar: is one of benevolence, one with a lot of 'feel good factor', one of "abundance" and a good year for business. Life in this year will be lived to the fullest and although there will be uncertainty it will be minimal. It is a rich year with impetuous acts, but care is recommended with any matters concerning money. The Boar is the symbol for great courage and integrity. Boar people don't make many friends, but when they do, they make friends for life, and anyone having a boar-year-born person as a friend is indeed fortunate. Boar people don't talk much, but when they finally say something, they let it all come out at one time, and there is no shutting them up until they have finished. Like monkey people, they have a great thirst for knowledge. They study a great deal and on the surface are generally well informed. However, if their knowledge is probed, it will be discovered that what they knows is limited. The Japanese saying is that such a person is broad in front but has a narrow back. Boar people are quite short-tempered, yet they have quarreling or arguments. They are affectionate and kind to their loved ones. They are shy and if they encounter any problems, they will not ask for outside help but will seek solutions to their problems by themselves. Boar people are advised not to get into lawsuits, for, being impulsive and hones, they will lose the suit to someone who is unscrupulous. I actually thought of you two when I heard the report on the radio and TV of the New Year and the fabulous luck of the Year of the Pig.